Meet Captain Kim Caley, owner of Interlinesail and S/V Slo Dancin'. Captain Kim is a full time U.S. Coast Guard licensed Captain, a part-time Pirate, a certified PADI dive instructor, an avid photographer and thoroughly knowledgeable of tropical marine life. Born in West Columbia, South Carolina, Kim studied at the University of South Carolina. 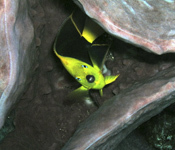 She arrived in St Thomas in 2003, knowing she had found her home. She has worked with various charter companies in the islands, gaining vast experience sailing throughout the Caribbean above and below the waters. 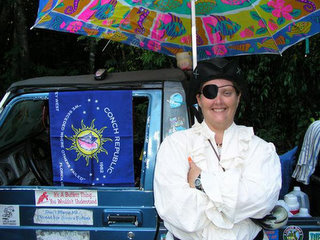 Come aboard S/V Slo Dancin and let Captain Kim demonstrate her love of sailing and fun - it's contagious! Forever Young's Captain, Larry "Mr. Clean" Fries, is a licensed US Coast Guard Captain who grew up on the Eastern Seaboard around boats. He learned to sail as a young boy, and spent many hours with his father aboard their boat in Long Island Sound. After college, Larry was a successful salesman in the paper industry and owned and operated several successful businesses in the DC/MD area. After selling the last of these, he set sail with his friend, Captain Omar Van Rooyen, the previous owner of Interlinesail and Slo Dancin' to relocate to the Virgin Islands. Upon arrival in the islands, he found and lovingly restored his 42 foot Catalina yacht, Forever Young. He also found his first mate/wife, Betty, who had escaped the academic life in Indiana and was making her home on Jost Van Dyke. 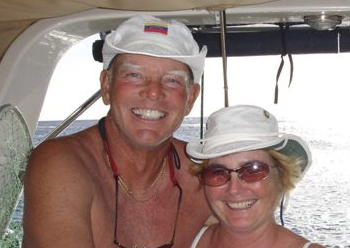 Betty and Larry completed a 6000 mile cruise aboard Forever Young from the Virgin Islands to Mississippi and back via South America and Trinidad.